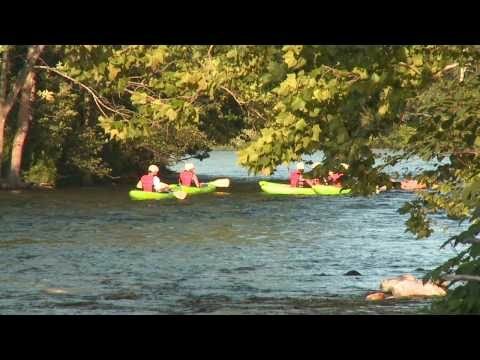 Kayaking down Massachusetts' Deerfield River is a great way to see the Berkshires and spend a warm summer day outside and active! These boats are easy to paddle and very stable, making them a great way to get a taste of whitewater kayaking with minimal instruction. We use single kayaks daily from May through October. Singles are great for children at least 10 years old and adults under 250 pounds who want the freedom to challenge the river on their own, while doubles give kids as young as 7 an opportunity to share a boat with an adult and enjoy the river. Guides accompany every trip on the river to help you find the correct line and to maximize your river experience. While these trips are not instructional clinics, they are a wonderful way to explore the Deerfield River with a guide close by to offer support, paddling suggestions and insight into the natural and cultural history of the area. Featuring both Class I and II rapids, as well as opportunities to swim and splash in the waters of the Deerfield, this trip provides a wonderful afternoon adventure for families, schools, scout and camp groups. We meet at 1:45 pm each day and the trip takes about 3 to 3 1/2 hours, including registration, outfitting and transportation to the river. You are required to wear water shoes, sneakers or other shoes that can get wet and stay on your feet well. No flip-flops or Crocs! In warm summer weather, some guests are comfortable in bathing suits/swim trunks or light layers. However, we ask you to not wear cotton, as it will keep you cold and wet throughout the trip. Wool and synthetic materials such as polypropylene, nylon, and fleece, are appropriate for cooler weather and water temperatures. Wetsuits, splash jackets, and neoprene river booties are available for your use. Bring required medications and extra money for souvenirs, coin-operated showers, etc. Before the trip, leave valuables including money and dry clothes and towels for after the trip in your locked vehicle. Expect everything you bring with you to get wet. We will collect your car keys after registration and return them to you when you get off the boats. Can I book a double kayak for two adults? Our double kayaks are intended for an adult and a youth to paddle together or one adult that exceeds 250 lbs recommended maximum weight for a single kayak. If you have concerns about booking into individual kayaks, please call our office at 1-800-532-7483 and we would be happy to answer any questions. We do not use nuts in our food, but cannot guarantee that the ingredients in our meals do not contain nuts or other food allergens. If you have food allergies or other special dietary needs, we strongly suggest you bring your own snack in non-glass containers and we will pack it with the trip. You're also welcome to call our office at 1-800-532-7483 with any questions about the snack. If you intend to bring your own snack, please let us know ahead of time, since we take all of the food for the day out on the river with us, and would need to plan on including your food. Wetsuit packages are included in this trip at no extra cost! Wetsuits are not required, but we have them should you want them! Wetsuits are ideal for those wishing to layer up for colder weather or those who tend to get chilly easily. The extra wetsuit layer helps to keep you warm, so it depends on personal preference! Will there be photos of my trip? Yes! One of your guides will snap photos of the trip. Back at base you'll be able to view your photos and purchase them on site. Yes! For every 11 people you book, the 12th person goes out for free. This discount applies automatically, so you can make your reservation online, or give our office a call at 1-800-532-7483. What happens if the forecast calls for rain or storms? We run our trips rain or shine, so you should come prepared for the weather. If we do have to cancel the trip, that decision would be made on the morning of the trip. However, it’s rare that weather forces us to cancel our river trips. If you are concerned about the forecast for your trip, you’re welcome to give our office a call at 1-800-532-7483. What do we do with our car keys? Keep your car keys with you during registration, as we will collect those and put them in a lock box just before gearing up, then return them to you when you get off the boats. This is completely at your discretion. If you feel the service you receive from your guide is exceptional, and you want to say "thank you" with a tip, although it is not expected, it is always appreciated. If you have had a guide you especially liked and would like to have them guide your next trip, we will do our best to match their schedule to yours. Simply request your guide when you make your reservation. Please be aware that we are not always able to match request, but we will do our best! Our Guided Kayak Rentals will paddle a five mile stretch of up to class II whitewater. While you don't need extensive previous paddling experience, you should have some canoeing or kayaking experience, or be gung ho, in good physical shape and comfortable in the water. Participants must be at least 10 years old for a single kayak and 7 years old (with an adult) for a double kayak. You will have to paddle and may have to self rescue by climbing back up onto the kayak from the water or swimming the kayak, the paddle and yourself to shore. Halfway through the trip, we'll pull over on shore to have a light snack of GORP and water- a great snack to fuel and refresh you for the rest of your trip. For all of our whitewater trips, guests must be able/willing to do the following: Wear a helmet and our personal flotation device (PFD), respond to and follow verbal or visual instruction, roll from front to back in water while wearing a PFD, demonstrate dynamic sitting position (sitting upright), and float with feet up in water. Specifically for our Guided River Kayaking, guests should be able to paddle in the rapids, but with frequent rests. Remain calm, lay flat, and orient their body so their feet are aiming downstream if they find themselves unexpectedly in the water. In the event they lose their kayak guests need to be able to swim their boat and themselves to shore. Our PFDs fit a maximum chest size of 56 inches, and our single kayaks are designed for guests 250 lbs or less. Our double kayaks are intended for an adult and a youth to paddle together or one adult that exceeds 250 lbs. Registration for this trip takes place at 7 Main St. in Charlemont, MA. You can park in the unpaved lot and head up the stairs to the kiosk outside the red building. There, guides will direct you to the appropriate pavilion. We run our trips and clinics regardless of the weather. In the event of a weather related cancellation, we would make the decision to cancel on the morning of the trip at Zoar Outdoor and would refund the trip in full. River conditions can vary based on rainfall, snow melt, dam operations and other factors. We reserve the right to modify or move a trip or clinic when we deem necessary based on expected conditions.